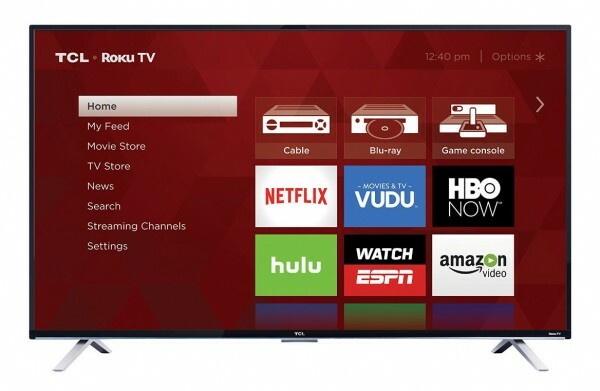 Roku has expanded its 4k range with support for Ultra HD on TCL-brand sets. The Roku TVs can access Ultra HD content from providers such as Netflix, Vudu and Amazon directly through the Smart TV software without the need for a set-top box or streaming device. Two 4K TCL Roku TVs are already available to pre-order from Amazon in 55” (55US5800) and 65” (65US5800) sizes, priced at $599.99 and $999.99, respectively. The smaller 4K TCL Roku TV will start shipping to customers on April 4th, while the 65″ model will begin shipping April 18th, 2016. TCL says the P130 series will also be offered in 43” (43UP130, $499.99), 50” (50UP130, $599.99), 55” (55UP130, $699.99), and 65” (65UP130, $1099.99) screen sizes, but didn’t mention release or pre-order dates. The TCL 4K TVs have a native refresh rate of 60Hz (120Hz Effective), display 3840 x 2160 (4K) video resolution, dual-band Wi-Fi and Ethernet, and four HDMI 2.0 inputs with support for HDCP 2.2 for UHD content. The S-series 4K TCL Roku TVs will be available from additional retailers starting in April. Last week, Roku TVs from Insignia went on sale at BestBuy.com, offering similar specs and price ranges.